Approx 45cm or 18 inch square 8oz canvas cushion cover natural colour to compliment any colour scheme in your home. Approx 45cm or 18 inch square 8oz canvas cushion cover natural colour to compliment any colour scheme in your home. Includes cushion fill. Beautifully sewn swallows in a colourful display of threads. Beautifully sewn swallows in a colourful display of threads. If you want a specific thread colour combination please email us before ordering. This embroidered cushion is a wonderful keepsake gift to commemorate a anniversary, birthday, housewarming gift or occasion! 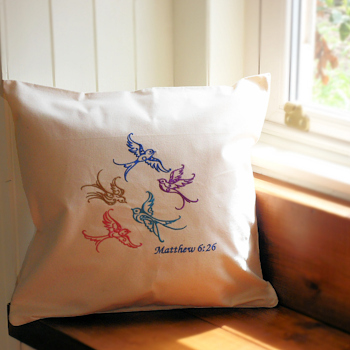 This cushion is custom made to order - usually within 48 hours.